A good Arts and Crafts 1/4 sawn oak chess table with alternating Burr Sycamore and Walnut squares to the top surrounded Mahogany and Ebony banding with further Rosewood crossbanding edged with Boxwood stringing. H 27". x W 27". x D 27". E W Godwin, attributed. 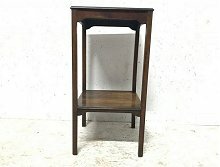 An Anglo Japanese Rosewood side table with subtle cut-outs to the skirt beneath the top and slender tapering splayed legs. Height 20", Width 16", Depth 16". 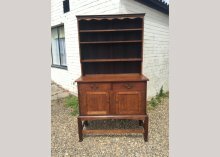 Liberty and Co Attributed, An Arts and Crafts oak double wardrobe with flaring cornice and fine inlaid stringing throughout. A central door with the original bevelled mirror flanked by stylised floral inlays to the upper panels with two lower large drawers and shaped apron to the base. H 80". x W 72". x D 25". Wylie & Lochhead attributed A pair of Glasgow school Arts & Crafts oak stick stands or matching plant stands. One with a drip tray and one without. I will sell separately. H 28". x W 6 1/2". x D 12"
H 60". x W 32 1/2". x D 16 1/2". 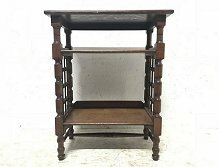 Liberty and Co. An Arts and Crafts oak music/book stand with lattice work sides in the Moorish style. Height 29 1/2", Width 23 1/2", Depth 19". Collinson and Lock attributed. 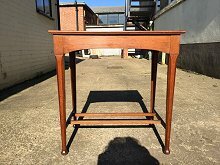 A Rosewood side table with four legs united by a lower shelf with shaped supports. Height 27 1/4", Width 14", Depth 14". Arthur Simpson. 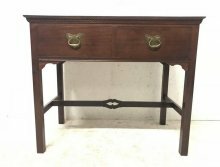 An Arts and Crafts F|lame Mahogany desk/side table with single drawer and stylised brass handles. 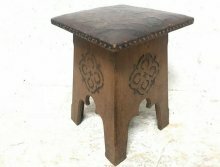 Liberty & Co, An Arts & Crafts Moorish Oak Stool with Embossed Leather Seat of stylised flowers in bloom. H 17", W 12", D 12." Liberty & Co attributed, an Arts & Crafts oak corner cupboard, the upper doors with a wonderful ebony inlaid motto of 'honesty' that reads :- 'Here be truths, do not hold the truths guiltily'. The doors with hand-hammered silvered handles and hinges, opening to reveal the interior with adjustable shelves. H 59.0", W 35.0", D 20.0." 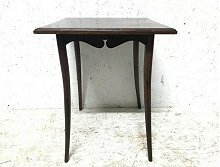 Edward Barnsley workshop, a fine sycamore and holly wood inlaid writing or side table with a shaped top and brass crescent shaped handles and an inlaid escutcheon plate. Stood on five sided legs united by a double serpentine stretcher. Stamped 'Barnsley' to the drawer front. H 26", W 30", D 13.6." H 24", W 19.2", D 19.2." 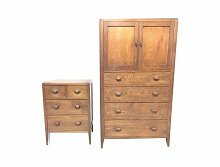 Heals attributed, an Arts & Crafts oak tallboy and matching petite chest of drawers with hand crafted handles and angled feet. H 33.6", W 24.0", D15." 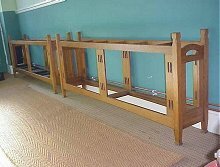 An Arts and Crafts Glasgow School oak settle in the style of M H Baillie Scott. Made by Wylie and Lochhead with sweeping curvaceous ends and a lower slatted detail, retaining it�s original fabric with fantastic stylized Glasgow Roses which I must say is also in wonderful original condition with minimal fading. The back has been re webbed by the last owners to support the fabric better and it is open for all to see. Heals limed oak dining suite consisting of a dining table, six dining chairs and two armchairs (making eight in total) and a rare matching mirror. Dining table L 60", width 33", height 29.5"
Chairs height 34", depth 16", width 18", seat height 18"
Mirror height 32", depth 1", width 21 1/2". 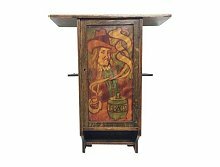 Liberty & Co., an Arts & Crafts oak smokers wall cabinet decorated to the door with a gentleman smoking a pipe. It has a groove to the top for displaying a large decorative dish with pipe holders to the sides. Height 27.5", Width 22", Depth 7.5"
An early Arts and Crafts Cotswold school walnut bureau of petite proportions, the design attributed to Ernest Gimson. The quality of this craftsman hand made bureau is almost unsurpassable. The fold down front inlaid with holly chequered string inlay, opening with stylised butterfly hinges onto automatic protruding supports with chamfered ends that extend to support the writing area when opened from underneath it. 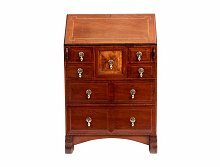 Inside reveals two drawers and six open pigeon holes above with a central two door arched cupboard with segmented top divided by ebony string inlay and an ebony key stone with ebony pillars to each side emulating a grand architectural doorway. The main body has through tenon details with exposed dovetail joints to the top and sides. 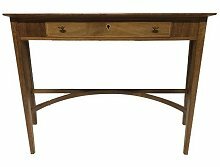 The drawer fronts having deep chamfered panels with the central drawer made from burr walnut giving a beautiful subtle contrast to the entire aesthetic of this bureau. There is lots of storage with eight drawers in all, retaining the original polished medieval style steel handles with pierced circular back plates and sweet little drop handles. The whole sat on bracket feet with a sweeping under tier. Craftsmans name E.R. WHISHAW stamped to drawer top. 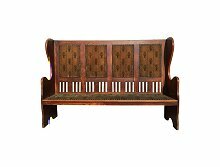 Furniture doesn't come much purer to the Arts & Crafts Movement in the Cotswolds than this beautiful little functional Work of Art with lots of storage. Height 36", Width 24", Depth 14"
An extremely rare Shapland and Petter Mahogany dining room set consisting of a Sideboard, a Buffet and two chairs. The Sideboard and Buffet all with stylised floral panels inlaid with fruitwoods, Pewter and Abalone, these panel designs are after a design by M.H.Baillie Scott and they are one of the most beautiful and pure Arts and Crafts designs that Shapland and Petter used. It is possible that Baillie Scott sold designs to Shapland and Petter. Sideboard Height 85 1/2", Width 60 1/2", Depth 22 1/2". Buffet Height 72", Width 46 1/2", Depth 22". Circa 1900. Height 33�, Width 57�, Depth 3�. 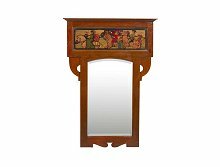 A rare Arts & Crafts oak mirror by Shapland and Petter of generous proportions with a wonderful colorful medieval hunting scene to the top with shaped supports below and retaining the original bevelled plate mirror. This has since been waxed and has no loss to the finish. Height 40�, Width 28�, Depth 6�. Waring and Gillows, a rosewood bow fronted display cabinet. 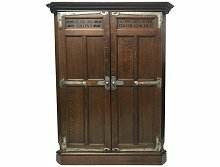 An outstanding Arts and Crafts display cabinet, with stylised ebony and pewter inlays. 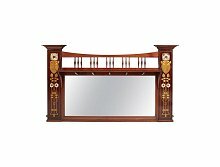 Arched beveled mirror to the back above display area, flanked by two upper shelves stylised inlaid detail below, with three glazed cabinets underneath. The lower doors with stylised floral entwined heart details. The whole standing on eight square tapering legs united by a lower display area. Height 74�, Width 60" Depth 21.5"
Liberty and Co, attributed. 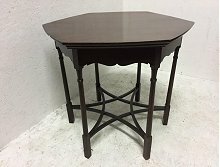 An Arts and Crafts flame mahogany center/side table in the style of Charles Spooner. With a subtly shaped six sided top, each of the sides gently curving. 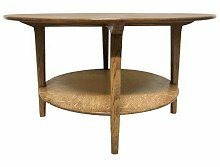 A well designed table with six finely turned legs united by a six sided star stretcher arrangement. Height 28�, Width across 32". E A Taylor. An exhibition quality Glasgow School oak side board designed by E A Taylor with wonderful stylised floral painted panels. To the upper section there is a pair of cupboards with a central plate rack and a full width plate rack below. A pair of drawers to the lower section which have been cleverly designed to be a part of the angular front, with a row of drawers below flanked by a pair of large cupboards and silver plated handles with split heart cut-outs. Liberty and Co, attributed. 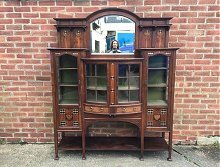 A very good Arts and Crafts oak bookcase with extending upper cupboard sections, the doors with hammered copper hingges and wonderful rotating floral designs to the stain glass. There are subtle little coiled moulded details just below the centre of each cupboard. There is a small piece of oak missing to the third right hand shelf from the top, to the centre. Height 68" Width 84" Depth 14". Edward Barnsley designed by, made by Charles Bray. A superior and impressive Cotswold School walnut breakfront glazed bookcase/cabinet designed by Edward Barnsley, and made by Charles Bray, dated 1932, with fine ebony and chequer inlaid detailing around each of the upper glazed doors with turned ebony handles and adjustable shelves behind. Flanked by slender concealed cupboards with adjustable shelves and further open adjustable shelves to each of the ends, the lower section with three conforming shaped cupboards with double fielded doors flanked with fitted end cabinets, with five drawers of various depths to each. Provenance Mrs D.E. Neale, commissioned in 1932. Aspects of Victorian and Edwardian Decorative Arts,Fischer Fine Art, catalogue number 6 illustrated page 13, description page 15 Private collection. H 77', W 88', D 24'. 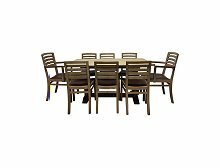 �Hayrake� Oak Dining table. Design number X133, made be C. Beadle. Octagonal legs, and with 'hayrake' stretcher, Russell Workshops paper label underneath. H 29', W 72', D 32.5'. I do have another almost identical table available. An Arts and Crafts carved oak wall cabinet. Height 20 3/4", Width 14 3/4", Depth 8 1/4"
Ambrose Heals. 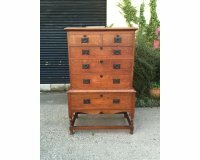 An early Arts and Crafts oak chest of drawers on turned feet, united by stretchers with iron metalwork. Height 59", width 26", depth 21 1/4". George Walton. A rare and important desk almost identical to the desk Walton designed in 1898 for Sidney Leetham for the Morning Room in Elm Bank, a major interior commission in York. Height 45" , Width 52.5" , Depth 32". 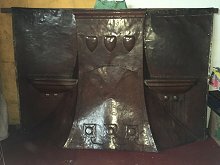 A unique Arts and Crafts copper fire hood, attributed to M H Ballie Scott, with repousse heart details to the hood and rivetted stylised flowers below and feature rivetted shelves. A high quality hand made work of art pure to the Arts and Crafts Movement. Height 59", width 75", depth 17". A Cotswold School two tier walnut side table with arch supports and through tennon details, on sledge style feet. Height 19.5" , Width 24" , Depth 17.75". 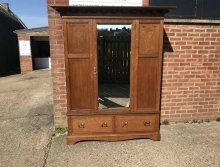 An excellent quality Arts & Crafts two door oak dresser with a shaped top, cascading upper shelf, with an arched apron on four square legs united by side stretchers. Height 76" , Width 42" , Depth 19". Arthur Simpson of Kendal. 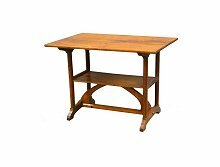 An Arts & Crafts oak side table with shaped apron, hexagonal tapering legs, united by twin H stretchers with through tennon details. Height 27.5" , Width 27" , Depth 17.75". A unique exhibition focusing a collection of pieces taken a quarter of a century to gather, coming in the late summer. 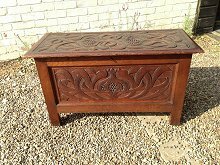 A rare Arts and Crafts oak linen trunk attributed to C R Ashbee and probably made by the Guild Of Handicraft with well executed carved stylised poppy seeds and interlacing leaf details. Height 22", Depth 17", Width 39". Circa 1890. 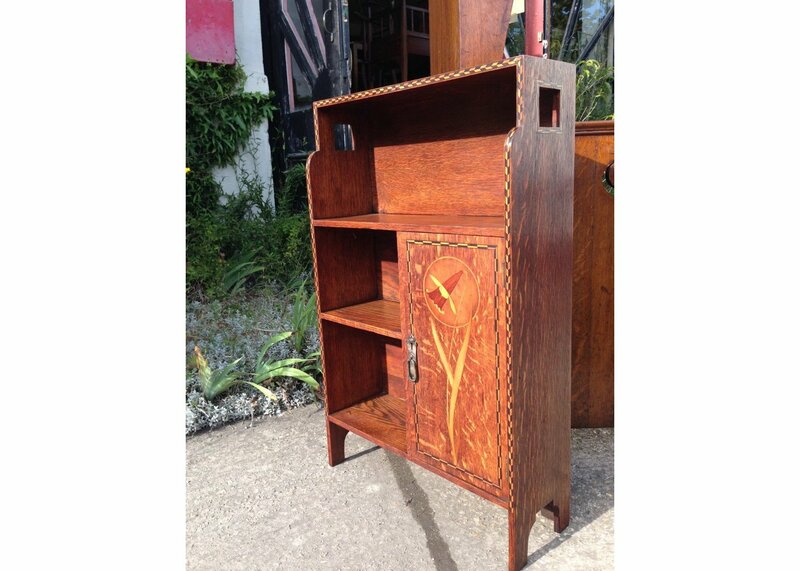 A good Arts and Crafts Mahogany table top revolving bookcase by Shapland and Petter with wonderful stylised floral inlays to the top and to the sides with S&P's unique shaped spindles and four compartments to hold books. Height 13 1/4" Depth 15 1/4" Width 15 1/4". It will accept books upto a 10 1/2" spine height. Circa 1900. 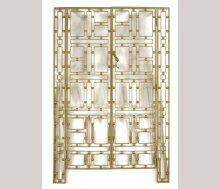 A good quality pair of iron and gilt security gates in the style of Josef Hoffmann. Height 72", Total Width across both sides including hinged parts 48", Hinged side parts are 5 1/2� each, total width across the middles 37�, Depth 1". Gillows of Lancaster. 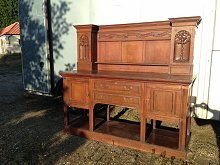 A super quality Arts and Crafts oak sideboard/dresser with motto :- 'WHEN FRIENDS MEET HEARTS WARM'. Flanked by two outer cupboards with stylised deeply carved floral details and ANNO 1898. With two central drawers flanked by a pair of large cupboards with good quality handles and strap hinges and open display area below on plinth base. Approx Measurements. Height 72" Depth 28" Length 80". 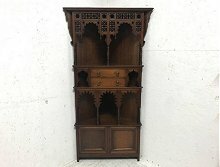 A very rare Arts and Crafts oak bookcase by Shapland and Petter. In oak retaining its original finish. The daffodils resonating with vivid colours throughout with remarkably no colour loss. The daffodil inlays were originally designed by M. H. Baillie Scott for furniture made by J .P. Whyte at The Pyghtle Works in Bedford. There are a number of Baillie Scott designs used by Shapland and Petter yet no association is known. Height 32�, Length 20�, Depth, 7�.